Flo, the brains of the outfit, is also a very creative person. Many of you have appreciated her annual Día de Muertos altars and cakes at KUVO and here at our little casa on the Northside. Some of you have seen her collection of folklore, and others know that her garden is loaded with color, gizmos and art. She also designs some of her clothes, organizes elaborate celebrations for grandchildren birthdays, decoupages, experiments with cookies and cakes, produces books and, on the side, keeps me in line. Life around Flo is never dull, sometimes dizzying, and always interesting. 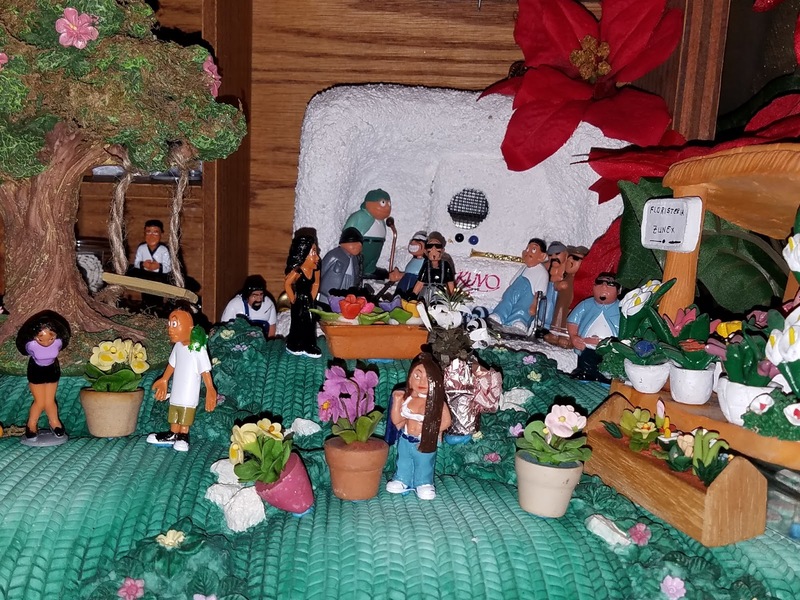 Her latest creation can be seen in the photo above -- a Christmas village with a twist. For some close-up views of the diorama, I've attached a few more photos and a video (please excuse the shakiness of my 69 year-old hands.) She calls it Homie Christmas. 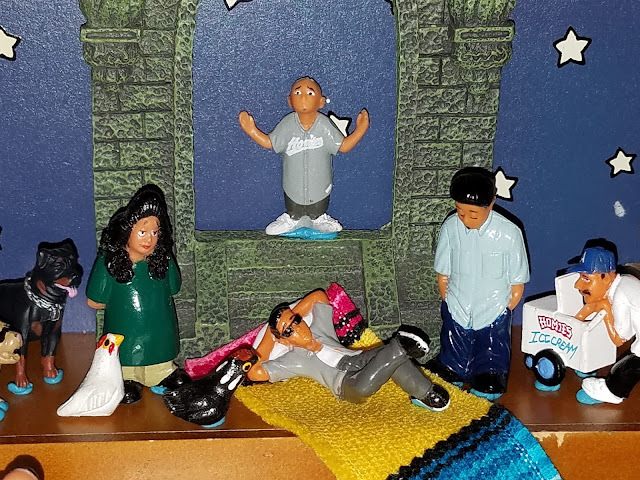 Once, in the Land of Make Believe (cue Chuck Mangione and Esther Satterfiel) a vato named Chuy the Cholo had serious doubts about where he was headed in his "so-called life," as he put it. In his search for truth, he traveled from a street corner to Chubby's to the pool hall to his favorite bar to his AA meeting, and everywhere he went, he asked, "Is this all there is?" People just looked at him -- he had a reputation, you know. He kept on, straight up 38th. He became more and more frustrated, not because no one knew the answer, but because no one took him seriously. At least not until he stumbled across the Christmas Pot Luck Dinner and Bingo Tournament in the basement of old St. Dominic's church. He'd heard about the pot luck but he always figured that it was for viejitas and their grandchildren, and people who had nothing better to do on a snowy night a few days before Christmas. But, he realized he was hungry, and he had nothing better to do on that snowy night a few days before Christmas, and although he didn't have any pot (and not any luck, for sure) to contribute, he did have half of a bean and beef special in his jacket pocket that he'd forgotten about. So, maybe he could trade a cold and stale half burrito for a warm fresh tamal? He walked into the basement and was immediately met by his old pal Sapo. But Sapo looked different -- more in control of himself, more at peace, which was really a surprise because Sapo was crazy, man, if you know what I mean. Sapo and Chuy bumped knuckles. Then, Sapo accepted Chuy's offering of a burrito half. The two walked to a large table in the middle of the hall. Sapo placed the burrito on the table. Chuy had no explanation for what happened next. By this time, the dry and stale half burrito had turned into a greasy bag of about a dozen steaming burritos that Sapo spread on Gloria O'Hara's pink glass serving dish. Chuy couldn't believe his eyes. "What the ...?" Chuy said. "It's Christmas, dude," Sapo answered. "And you're in the basement of St. Dominic's, and you gave what you could, and in case you hadn't noticed, you're right in the middle of Homie Christmas." Chuy blinked his eyes. "What the hell is that?" "Easy, dude. You're in a church." "Sorry. I'll re-phrase. What the hell is a Homie Christmas?" Sapo smiled. "Take a look, bro. It's all around you." And sure enough --- the basement had become a wonderland of sights and sounds that Chuy had never imagined, much less seen. 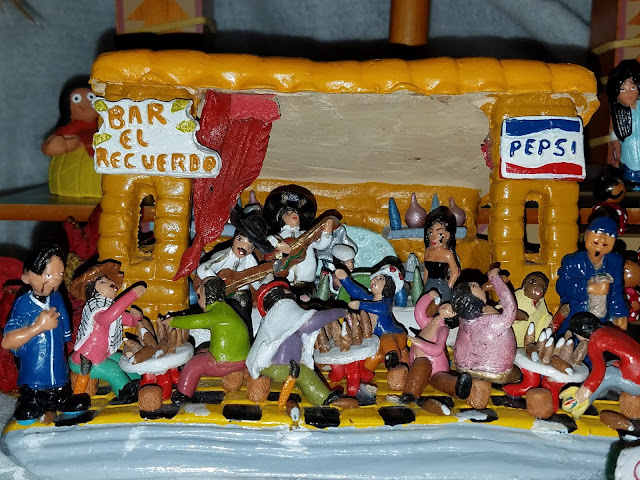 Over in the corner was a living nativity, with some of his old posse acting the parts: Chula as María, Dreamer as Jesús, Sleepy as José and Peewee as the Angel. 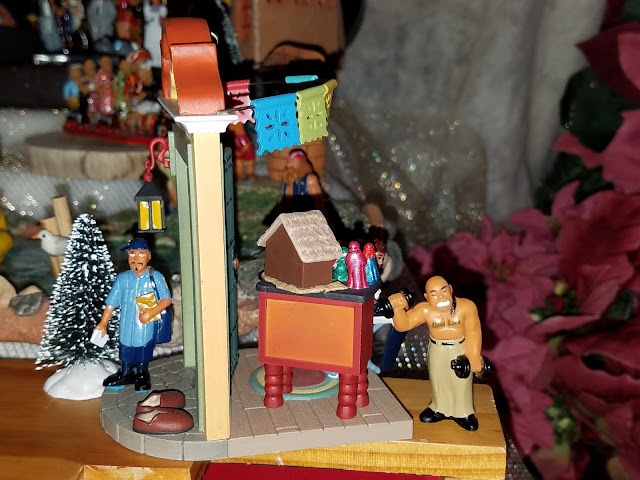 The wise guys bearing gifts were neighborhood fixtures: Oranges Vato, the paletero and the panadero. Padrecito played the Shepherd, along with a pack of street dogs. There was more. A couple of ex-cons watched a cockfight (no animals were harmed in this production.) A band of young priests played the greatest hits of José Alfredo Jiménez. Officer Placa ate doughnuts and no one cracked a joke. At the other end of the basement, summer had returned and adults and children mingled among grass-thatched huts where vendors sold fruit, hats, flowers, pots, or bread. Chuy could've had a haircut, if he wanted one. Or, he could've bought a fine piece of wood furniture from the carpenter's shop. 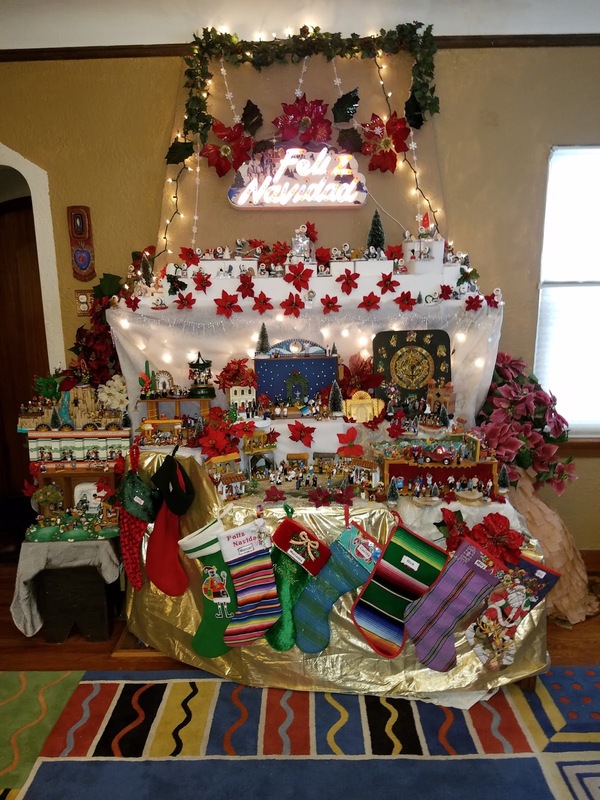 He kept looking and what he saw ... well, to get an idea, check out Flo's Homie Christmas display. And Chuy? Well, he never quite got an answer to his question. ¿Sabes qué? When he sat down and ate his tamal, which turned out to be exactly like the tamales his abuelita used to make when he was a child and which he never had his fill of, he realized that as long as he had a warm tamal, and he was surrounded by friends, and everyone was laughing or singing, and no one cried and no one made any pedo, then he really didn't need an answer, and he forgot the question. And he had a very merry Christmas. Thanks to Rudy Ch. Garcia for the gift of his homie art commemorating KUVO. 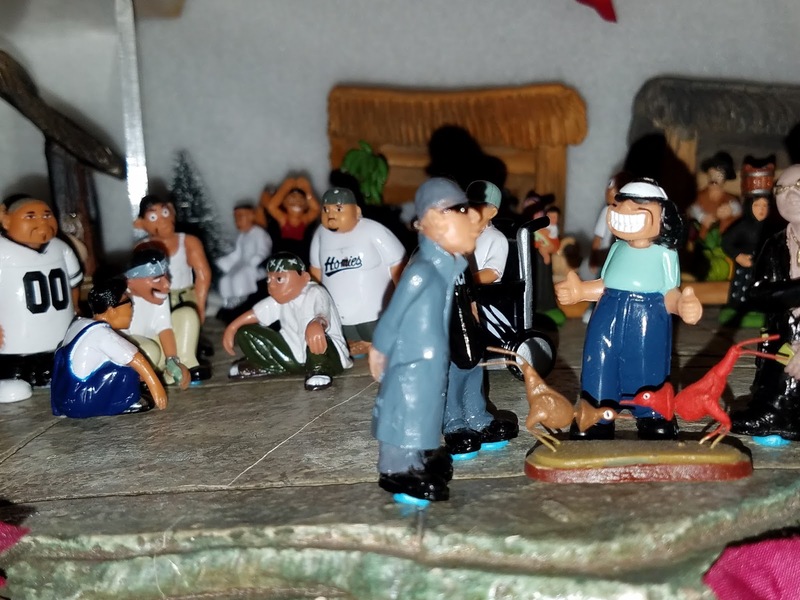 Feliz Navidad by the Barrio Boyzz. The YouTube glitch should be fixed. I shared thiss on my fb page. As usual it was removed from my fb page. Anytime I share from A Bloga,it's removed! Any idea why & who's doing it?